My son really wanted to make his own valentines this year and after a couple different ideas settled on passing out slime! Making slime is really fun, super easy, and (surprisingly) not messy. Pour 8oz of Elmer’s glue into a glass bowl. Add whatever color food coloring you choose. Put 1 teaspoon of Borax (a laundry product) into a small cup. Fill the cup up most of the way with water. I just eyeball it. I’m guessing 2/3 of a cup of water. Slowly add the Borax water to the glue bowl. Keep stirring. Knead the slime until it’s absorbed the water. Since you’ll be working with Borax the actually making of the slime should be done by a grown-up. As you begin to add the Borax solution the glue starts to become rubbery and super cool. The two products actually react together and become polymers so making slime also doubles as a science demonstration! Once we were done making (and playing with) the slime we divided it up into snack sized bags. One batch of the recipe above made enough for 12 bags. 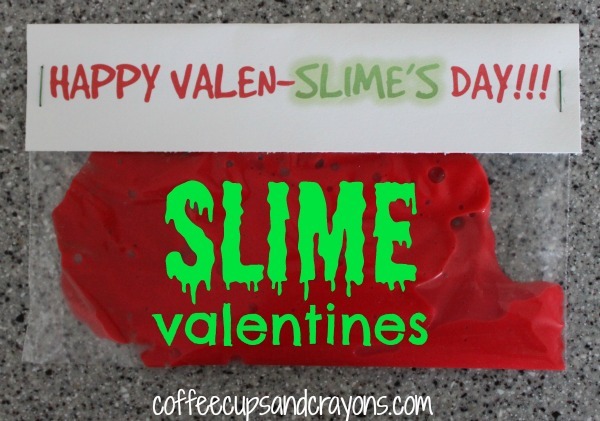 I typed up Happy Valen-slime’s Day! bag toppers and stapled them to the top of the bags. You can print out the free printable Valenslime bag toppers by clicking on the link below. 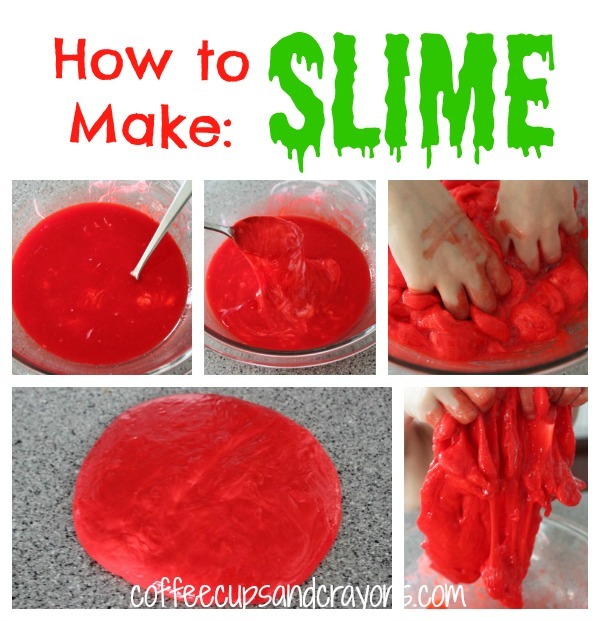 Slime is such a great sensory experience for kids–definitely something worth trying! Especially since there are so many learning activities involved. While preschoolers may not remember the term polymer they are exploring their world and building the vital background knowledge that will help them succeed in school. Plus, it really is just plain cool to play with! This is the most original Valentine idea I’ve seen all month! My kids get all the credit for the idea, but I totally thought of valen-slime! Super cool and crazy easy…I see many more valen-slime cards in our future! Thanks Erica! Very cool! But, I can’t get the toppers for the bags. When I click on them it just takes me back to the same page. How do you store it? And how long does it keep? Thanks for the great idea! Definitely going to try it!! Nope. It’s fine just in the ziploc bags! I am in love with the Megan. I’m totally sharing it on Facebook. We kept ours in the ziploc bags for weeks and it was fine! That looks fun to play with and very creative idea as a valentines card!! They loved it! Thanks Ariadne! Great idea, but in a couple of pictures…..the word placenta keeps coming to mind! Gonna have to use a different color for mine. LOL! We made some pink ones too using less food coloring that may look better for you! These are wonderful ideas for daycares…thanks so much for the idea! What an awesome class gift! I just love it.